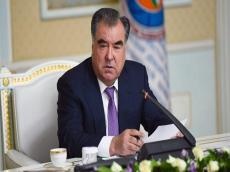 President of Tajikistan Emomali Rahmon has paid a working visit to Kazakhstan at the invitation of President Nursultan Nazarbayev, the press service of the head of state said. Tajik president will take part in solemn events dedicated to the 20th anniversary of Astana. Astana and the regions of the country will host various cultural events, concerts, sports competitions, art festivals, and photo contests on the "Capital Day". Rahmon will hold several bilateral meetings in the capital of Kazakhstan during the visit. Kazakhstan is marking the Capital City Day on July 6. The international presentation of Astana as the capital was held on June 10, 1998. It was just on this day that the holiday was celebrated at the city level until 2008, when the President of Kazakhstan Nursultan Nazarbayev signed amendments to the legislation providing for the establishment of a new state holiday Capital City Day on July 6. Astana received the status of the country’s main city on July 6, 1994, when the Supreme Council of Kazakhstan decided to move the capital from Almaty to the city, which was called Akmola at that time. Officially, the transfer of the capital took place on December 10, 1997, and Akmola was renamed as Astana by the decree of president on May 6, 1998.